The Masaryk Circuit (Masaryk?v okruh in Czech, viagra sale here Masarykring in German) was a road race course which ran in a circuit near the city of Brno (Brünn in German) in Moravia (Mähren in German) in what was then Czechoslovakia and now the Czech Republic. 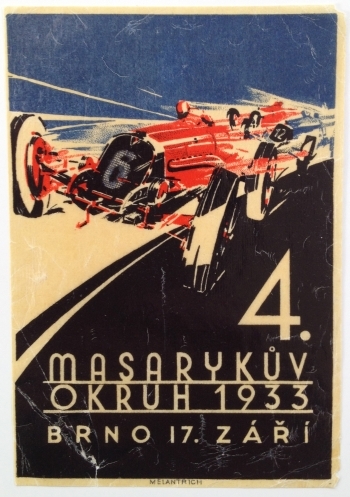 The circuit hosted a number of different races which started in 1930 including the Masaryk Gran Prix. It is now called the Brno Circuit. 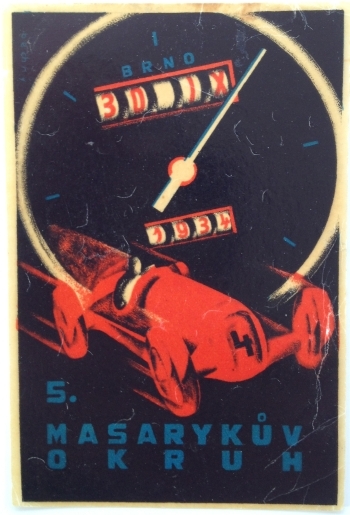 The two items in my collection are for the Masaryk Grand Prix’s that were held in 1933 and 1934. These are labels rather than poster stamps, viagra sales and about the size of a large luggage label rather than the usual normal stamp size. It is likely that these were sized like were meant to be affixed to luggage, trunks or racers’ storage containers to demonstrate participation in the races. The label for 1934 celebrates the “5. Masaryk?v okruh Brno on 30 IX 1934” (5th Masaryk Circuity Brno 30 September 1934). This is beautiful image celebrating movement and is an excellent example of 1930s European modernist graphic design. The incorporatation of the date into the odometer is just brilliant. Both are unsigned by their artists though the label from 1933 bears the name “Melantrich” which was the semi-official publishing house of the Czechoslovak state. The label for 1933 celebrates the “4. Masaryk?v okruh Brno on 17. zá?í 1933” (4th Masaryk Circuity Brno 17 September 1933). This label does not have quite the elegance of the label for 1934 but is beautiful in its own way: It captures the movement and speed of the racing car in a modern depiction and uses sans-serif font with an out-sized “4” leading the text description.